The LG WM8000 offers a large amount of space for stackable units. (No more towels coming out of the dryer in tightly wound tubes!) Of course, they take up a bit more space as well. So if you’re buying these to replace your current stackable washer-and-dryer, make sure you measure the space and allow a little extra room for the vent. You’ll also want to double check the width of your laundry-room door and consider whether you’ve got the reach to operate the dryer without a step stool. The machines wash and dry well. Features include useful extras like turbo-wash and and a steam dry cycle to freshen your clothes after a night at the bar. There’s even a door catch for the washer that prevents it from sealing when not in use, which keeps the inside clean, fresh, and mildew-free. The drain and lint trap are easy to reach and clean, so if any little ones are leaving irreplaceable treasures in their pants’ pockets, you’ll probably be able to recover them. Both units are pretty quiet, and the electric versions are very energy efficient. 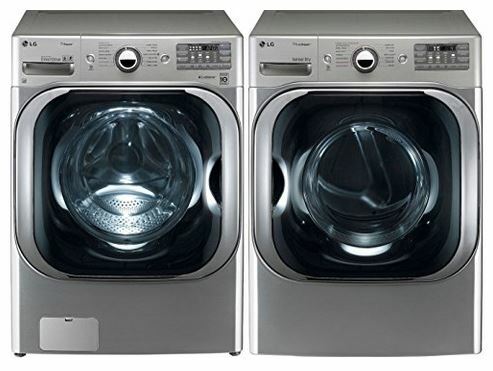 One customer estimated a seven-dollar-per-year electric bill for the washer. The washing machine offers a detailed level of control over things like water temperature, level of dirtiness, and spin speed. The dryer cycle also offers fine-tuning options. Someone taking full advantage of these features could make a serious dent into washing and drying times. (One Amazon user reported being able to cut down washing and drying times by by up to 65 percent!) Add that to the machines’ spaciousness and you could see an improvement to your quality of life, particularly if you’re one of those people with a large family whose laundry chores seem to never end. As far as functionality, these are absolutely top of the line. If you’re someone who gets a special satisfaction from having the right tool for the job, you’ll enjoy the set. There is a caveat, however. And it’s not minimal. The manufacturer, LG, typically abandons its machines after seven years. That is to say, they cease making replacement parts. If your washer or dryer requires repairs (and today’s appliances, no matter the brand name, simply do not last as long as they used to) after the seven-year mark, you’re going to find yourself combing craigslist for busted units to harvest them for parts. For your information, the LG WM8000 came out in June 2013. If you find that you really like the machines, but you’re nervous about its inevitable obsolescence, you could buy a second set of main control boards, which are the parts that will typically need to be replaced when the machines finally fail. That said, there’s no going back to the days of the Maytag repairman. And it’s partly our fault. More and more, we consumers value innovative features over durability, and manufacturers have taken the hint. Just like smart phones, home appliances are being sold as the latest and greatest, not the longest lasting. In this brave new world, it’s hard to do much better than the LG WM8000 and DLEX8000V. Back to our Top Picks of the Year.